The Village Times Herald published this piece in print on Oct. 22, 2016. When Jennifer Portnoy of Stony Brook was given her son’s diagnosis, the doctors told her that there was nothing she could do but love him and enjoy her time with him. Javier, she was told, had a rapidly progressive form of Duchenne Muscular Dystrophy, an incurable genetic disorder most prevalent in boys. Portnoy co-founded Hope for Javier Inc. a few months later as a not-for-profit organization to help fund research that might lead to an effective treatment or cure. Her family travelled to Cincinnati for doctors’ appointments and medical treatments. Along the way, she met other families in the New York-area who did not have the job flexibility or financial resources to travel for out-of-state care. 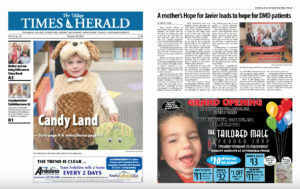 Portnoy said she realized that with Hope for Javier’s size, it could have an “enormous impact” by addressing that disparity in access to health care. After researching other area hospitals, Portnoy and Hope for Javier formed a partnership with Stony Brook Children’s Hospital to create the first DMD Center in the tri-state area. 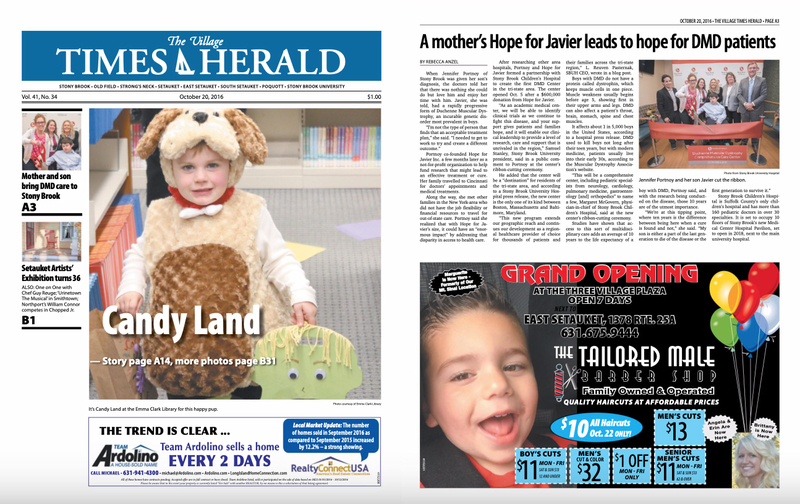 The center opened Oct. 5 after a $600,000 donation from Hope for Javier. “As an academic medical center, we will be able to identify clinical trials as we continue to fight this disease, and your support gives patients and families hope, and it will enable our clinical leadership to provide a level of research, care and support that is unrivaled in the region,” Samuel Stanley, Stony Brook University president, said in a public comment to Portnoy at the center’s ribbon-cutting ceremony. He added that the center will be a “destination” for residents of the tri-state area, and according to a Stony Brook University Hospital press release, the new center is the only one of its kind between Boston, Massachusetts and Baltimore, Maryland. “This new program extends our geographic reach and continues our development as a regional healthcare provider of choice for thousands of patients and their families across the tri-state region,” L. Reuven Pasternak, SBUH CEO, wrote in a blog post. Boys with DMD do not have a protein called dystrophin, which keeps muscle cells in one piece. Muscle weakness usually begins before age 5, showing first in their upper arms and legs. DMD can also affect a patient’s throat, brain, stomach, spine and chest muscles. It affects about 1 in 5,000 boys in the United States, according to a hospital press release. DMD used to kill boys not long after their teen years, but with modern medicine, patients usually live into their early 30s, according to the Muscular Dystrophy Association’s website. “This will be a comprehensive center, including pediatric specialists from neurology, cardiology, pulmonary medicine, gastroenterology [and] orthopedics” to name a few, Margaret McGovern, physician-in-chief of Stony Brook Children’s Hospital, said at the new center’s ribbon-cutting ceremony. Studies have shown that access to this sort of multidisciplinary care adds an average of 10 years to the life expectancy of a boy with DMD, Portnoy said, and with the research being conducted on the disease, those 10 years are of the utmost importance. Stony Brook Children’s Hospital is Suffolk County’s only children’s hospital and has more than 160 pediatric doctors in over 30 specialties. It is set to occupy 10 floors of Stony Brook’s new Medical Center Hospital Pavilion, set to open in 2018, next to the main university hospital. Jennifer Portnoy and her son Javier cut the ribbon. Photo from Stony Brook University Hospital.